The Albuquerque International Balloon Fiesta attracts hundreds of thousands of visitors to the Duke City each year to watch nearly 600 balloons soar into the crisp blue New Mexico sunrise. Now a new exhibit designed and built by University of New Mexico School of Architecture and Planning (SA&P) students is helping visitors understand why Albuquerque is uniquely equipped to host the world-famous event. The new exhibit is called the Weather Lab, and it’s located at the Anderson Abruzzo International Balloon Museum (or, the Albuquerque Balloon Museum). Overlooking the 365-acre Balloon Fiesta Park, the Albuquerque Balloon Museum is a wonderland of interactive, educational exhibits and showcases – ranging from the history of hot air ballooning, to the actual balloon capsules that carried pilots on their world-record breaking journeys. In the far northwest corner of the museum, right next to the wall of windows that provide a panoramic view of the launch field, is one of the museum’s newest installations: the Weather Lab. Designed by associate professor Geoffrey Adams at UNM SA&P, the Weather Lab incorporates interactive technological interfaces with artistic design to give visitors a hands-on journey through the different factors that create weather in New Mexico. Four walk-through weather “pods”, created in the UNM SA&P Fabrication Lab, allow museum-goers to explore sun, wind, cloud and precipitation effects on weather patterns. Each pod has unique interactive experiences and activities where participants can change atmospheric elements, and view how those changes impact weather in a virtual simulation. A father and daughter learn about rain in the precipitation pod. While guests expand their meteorological knowledge, they are also treated to a unique artistic installment. Each weather pod was built with visual intrigue in mind, and depicts certain elements of the weather housed within. For example, the precipitation pod was built to imitate virga – the official term of those streaks of rain that hang under a cloud, but evaporate before hitting the ground. When visitors enter the precipitation pod, the effect is enhanced by the lighting and design of the pod, which reflects off the ground and guests in a pattern that resembles rain. 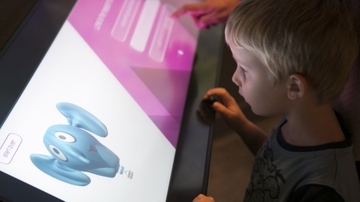 A young visitor designs his balloon to launch into the virtual Albuquerque Box. 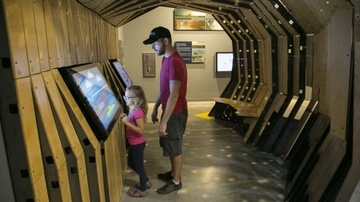 Further into the exhibit, visitors get to explore the special meteorological effect making the Duke City is an ideal place to hold balloon fiesta: the “Albuquerque Box”. Every autumn, terrain surrounding the city creates a temperature inversion, with cold, dense air from the northern mountains pouring south, into the valley, and creating predominant winds at lower altitudes near Balloon Fiesta Park. But at higher altitudes, warmer air flows back towards the north. This circular movement of winds creates the “Albuquerque Box” effect – allowing balloon pilots to take off and be carried south at lower altitudes, then climb to higher altitudes and be carried north again, very nearly landing in the same place they took off from. In the Weather Lab, people can create their own hot air balloon, choosing style, size and color, then launch it into the Albuquerque Box. The computer simulation takes into account how the design and weight of the balloon would respond to the circulating winds, and projects the flight path onto the wall, so visitors can watch their balloon soar over the city. The Albuquerque Balloon Museum is open for extended hours during Fiesta. To read more, click here. Daily 6 a.m. – 6 p.m.